I know I've banged on about not posting text-as-graphics to the Internet often enough. I know all my friends are bored of me doing it. But this picture, which I've seen for the first time today, makes the point far better than anything I could write could. For those of you who can't see the image, it's a visual joke: what is called a sight gag. It shows a very expensively built, obviously architect designed, building. All across the front is a flight of steps, leading up to the plinth on which the building stands. 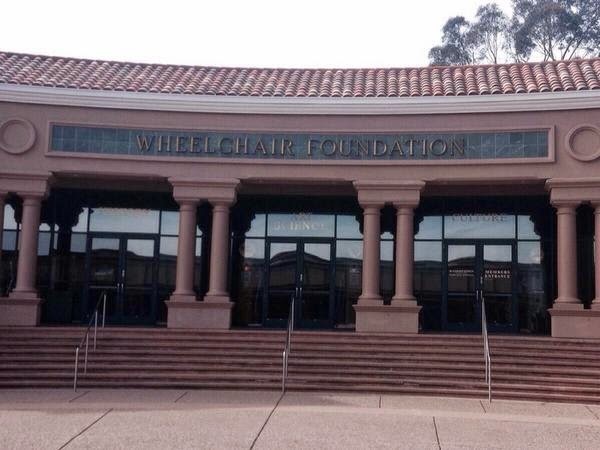 And the joke is this: the building is emblazoned with the words 'Wheelchair Foundation'. We take in the dissonance between the sign, and the steps which clearly make it impossible for a wheelchair user to access the building, and we laugh. Computers have made a wonderfully accessible space for people who cannot see. Screen-reader software intercepts the stream of characters as the computer prints them on the screen, and reads them aloud. No longer do books and newspapers have to be painstakingly transcribed into Braille. Someone who cannot see, can still have access to everything that is available as text to their computer. Until some unthinking person needlessly builds steps across the wheelchair ramps. You wouldn't do that, would you? You wouldn't needlessly prevent a wheelchair user from a building they otherwise could use. You'd see that as an impolite, a disrespectful, a boorish thing to do. Well, that's what you do when you post text-as-graphics to the Internet. You're planting bollards in the middle of the wheelchair ramps. It's impolite, disrespectful, boorish - and almost never necessary. Don't do it.